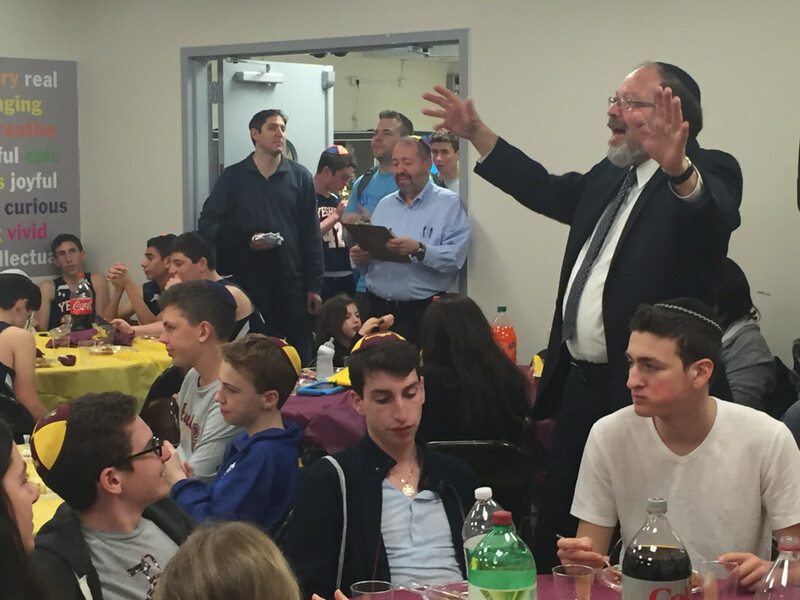 All the preliminary games have been completed, all the shabbaton activities are in the past, and it all came down to two final games – one to decide the 3rd place finisher and one to determine the 2016 Hausdorff winner on Championship Sunday (12/4) at the Falcons Nest in Brooklyn, NY. 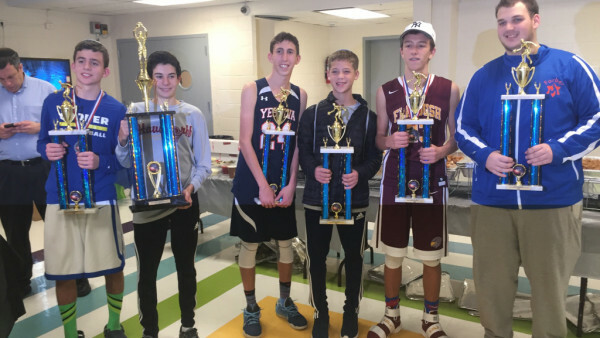 Pre-game festivities included the final group shacharit tefilot, a nice bagel breakfast and the completion of the Hausdorff Tournament Skills Competition. Individual and team contests in 3-point shooting, foul shooting, hot-spot and 2-ball. The teams from Detroit and Memphis then stepped out to center court to tip off the day’s first game. With Cooper looking to avenge the loss just the night before, the Macs took the very early lead, 2-0, on a basket from #5. Amazingly, it became an incredibly defensive battle the rest of the way, as the teams pressured the ball over every inch of the court, and when Farber’s effort to take the last shot of the quarter led to an errant heave as the clock neared 0:00, the score stood 2-0 Cooper after one quarter of play. Cooper was next to get back on the board, and finally the Pioneers found the bottom of the net to make it a 4-2 ballgame 2 minutes in to the 2nd period. The defense stayed tight and the teams played even the rest of the way, and Cooper held a slim 11-9 lead at the half. The second half saw Farber finally find their rhythm, getting the ball to drop at a better rate than they had been, and held a 20-13 lead with the clock winding down on the period, until the Macs found Ezra Cooper in the corner who stepped up and drilled the corner 3 to make the score 20-16 with one quarter left to play. When Yisrael Wiener converted an offensive rebound and the ensuing foul shot, the teams were even. 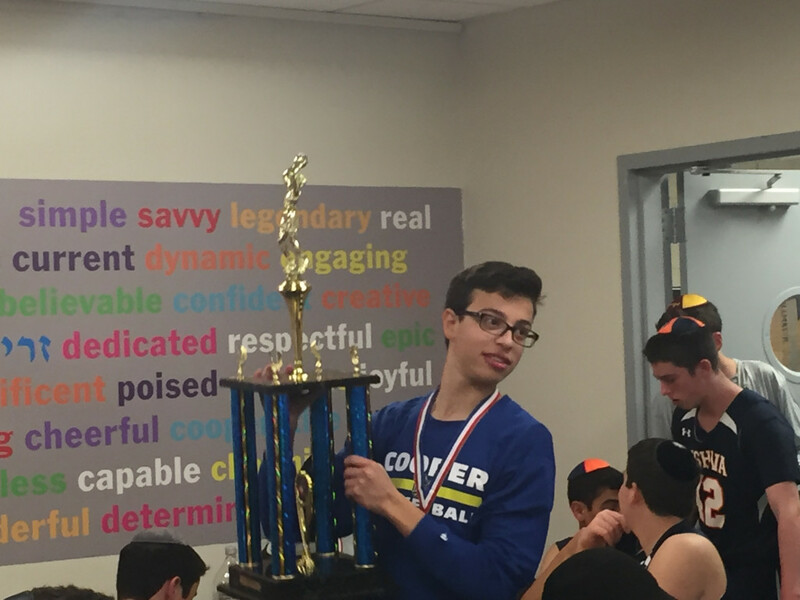 And when Yoel Weinsterin hit a three on Cooper’s next possession, the Macs were back in the lead once again, 23-20, their first 4th Quarter lead of the Tournament! With under 3 minutes to play, Cooper had extended its slim lead to 27-21. But Cooper could net get comfortable, as the Pioneers put together 5 quick points to make it a one point qame with 2 minutes to play. That set the scene for a wild finish. With Cooper holding the lead and the ball, Farber was forced to foul. The Macs converted 3 of 4 and went up 30-26, with under a minute left. Farber then got the ball in the hands of Yoni Wrotslovsky, who elevated and swished a 10-foot jumper to cut the lead to 2. Farber then got the big turnover they needed. The Pioneers had the ball with a chance to tie, or even take the lead! But they fumbled the ball away as they crossed midcourt, handing it back to the Macs. The macs converted 1-2 from the line, and Farber again had the ball with a chance to tie. But they came up empty. Cooper again went to the line and hit 1-2 to seal the game, and secure the 3rd Place trophy with a 32-28 victory! After an abbreviated warm-up, the contenders for the Hausdorff Championship took the court – the Katz Storm against the host Flatbush Falcons – a rematch of the night before's contest that went down to the wire. Flatbush opened the scoring, but Katz had the immediate answer for the 3-2 lead, answered right back by Flatbush’s Eddie Lincer for a 4-3 Falcon lead. It looked like it would be a see-saw affair when Andrew Pearl hit a floater in the lane to give the Storm a 7-4 lead early in the game. Katz extended it to 11-4 before Flatbush gathered their legs underneath them and began to really hit the boards. rebounded gave Flatbush some momentum, and the Falcons closed to within on at the end of the quarter, with the Storm holding a 13-12 lead. The 2nd Quarter looked like a mirror of the 1st, as the teams played close for the first few minutes until Katz got some separation to take a 25-17 lead. But Flatbush cut it back down to a 1-point game on five straight points from Eddie Lincer. And, that was where it stayed as the buzzer sounded to end the half, with the score 25-24 in favor of the Katz Storm. One minute and half in, Flatbush’s Noah Sedaka gave the Falcons their first lead since early in the game on a pair of free-throws, 26-25. But the lead did not last long, as Pearl again drained a three to give Katz back the lead, 31-28. The Storm then got a big stop and a big lift from Brandon Munter, who hit his own 3-ball. Katz had a 6-point lead, and Flatbush called timeout. With that, the gloves came off, as the shooters stepped up. Isaac Rosen drilled a three to give Flatbush back the lead at 38-37. Pearl stroked a three to answer and give the Storm back the lead, only to see Flatbush work the ball until it found its way to Joe Kattan who swished a three with the clock winding down to give Flatbush the one point edge heading into the final quarter of play, 41-40! With every possession golden, Yitzi Eisenberger of the Storm knotted the game once again with a banked 3-pointer that made it a 43-43 game with 4:33 left on the clock. Living beyond the arc, Andrew Pearl gave Katz the lead back 30 seconds later, 46-43. A Sedaka follow on a rebound brought Flatbush back to within one with 2:30 to play. With the clock winding down, the fans were all on the edge as the endgame played out. Each team came up empty on their next possessions, and it was Flatbush that found the bottom of the net next, with Eddie Lincer hitting another big three to give Flatbush a 48-47 lead. Katz missed on its next look at the basket, and the Falcons could the Storm in transition, with Abe Chetrit hitting the contested lay in to give Flatbush a 3-point cushion with less than 30 seconds to play. Choosing to let the play flow, Katz did not immediately call time out, hoping for a good look as play moved towards the Storm basket. But the Katz boys became too patient, and when it was clear no open shot was soon coming, the Storm called timeout – leaving them only 2.2 seconds left to try to get the equalizer. Flatbush, hoping to deny a chance at a 3-pointer to tie, fouled the inbound immediately, but Munter wisely sent the ball rimward as soon as he was fouled. The referee called the foul on the shot, awarding Munter 3 free-throws, and a chance to send the game to overtime. But, Munter came up short on the first shot. He hit the second to close the gap to 2. Needing to get one more possession, Munter intentionally missed his final free-throw, but the rebound was tipped around and then settled into a Falcons grip as the buzzer sounded, securing the Flatbush victory, 50-48, and bringing to a close one of the most exciting final days of play in the history of the Hausdorff Tournament. As exciting as the final day of games was, it paled in comparison to the joy and energy that was shared by all the participants over the course of the entire 4-day event. As the boys and the committee members settled in to the Flatbush Student lounge for the closing ceremonies and presentation of awards. Rabbi Besser opened with one more Dvar torah, focusing on the breaking down of walls, of allowing others to affect us, breaking down barriers and thereby enriching our lives. he noted how open and eager the three guest schools were to embrace new experiences and as well enriched the lives of the Flatbush hosts. He then noted the driving force behind the Hausdorff Tournament and Shabbaton, Coach Mike Gelber, without whose effort, love and commitment the event would not happen. he then presented the winners of the skills competition, handed out the team trophy awards and presented the All-Tournament team. The final word belonged to the four coaches of the different teams, all who were gracious guests (and hosts) and shared the theme of teamwork and community. As a final item, the participants were treated to a slide show presentation of photos from the entire tournament’s games, put together by Flatbush graduate Joey Baum, with photos taken by Flatbush Senior Sarah Cohen. In the end, the connections are what it is all about, and no greater testament could there be to the spirit of Thomas Hausdorff. Chazak U’Baruch to all, and we will see you in 2017 for Hausdorff 22!